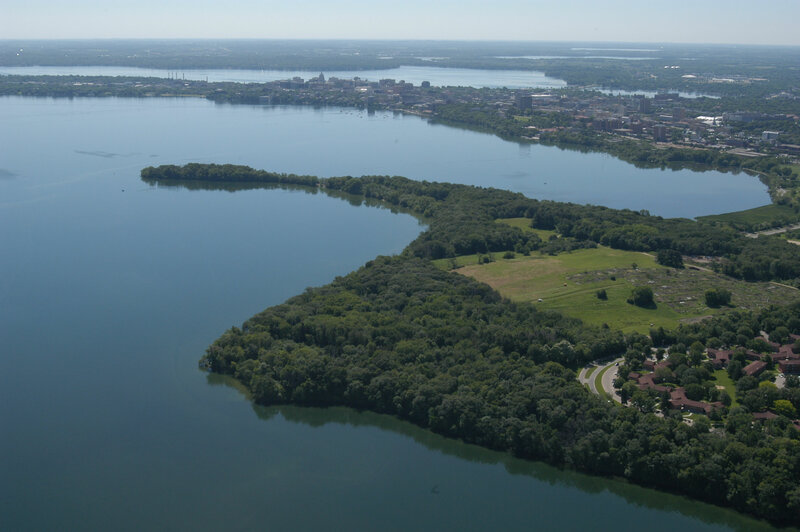 In 2006, the University of Wisconsin-Madison produced the first Master Plan for one of the most celebrated and beloved natural areas in Madison: the Lakeshore Nature Preserve, which includes Picnic Point and the Lakeshore Path. Our goal is to manage this precious place to protect its distinctive natural features and to increase the enjoyment and understanding of visitors, so that the Lakeshore Nature Preserve can serve as a national model for how cities and universities can protect and sustain the natural areas within their boundaries. poorly managed or inappropriate human use. The master plan makes important recommendations for addressing these threats, and also for restoring natural habitats, reintroducing natural processes like fire, enhancing visitor experience, and making the Preserve even more beautiful. But we will only be able to implement these recommendations if we can find the resources-both from the state and from generous private donors-to do so. The Preserve came into being over many decades through the accretion of parcels of undeveloped land–in part by accident, in part through the efforts of far-sighted people who wanted to protect natural areas on campus. Now that the campus is reaching the limits of its site, we’re finally able to recognize how extraordinary it is to have 300 acres of undeveloped land and four miles of shoreline as defining features of the campus. The Preserve symbolizes not just the beauty of UW-Madison, but its core values as one of the preeminent environmental research universities in the world. The new master plan lays out an exciting agenda–a greenprint, as it were–for putting the university’s environmental knowledge and values to work right in our own back yard. Where can I get a copy of the 2006 master plan? This 10-page document provides a concise overview of the entire master plan with guiding principles and key maps. The master plan is a content-rich document with many maps, historic images, and descriptive text. How long had the master plan been in the works, and how was it produced? Formal work on the master began in the middle of 2004, when Ken Saiki Design was hired to serve as consultants for the process, with Ken Keeley and Rebecca Flood serving as lead members of the planning team. (Prior to 2004, the predecessor of the Preserve Committee spent two years under the leadership of then Chair John Harrington defining the core management and stewardship principles that inform the master plan.) The consultants have worked closely with the Preserve Committee, with Preserve managers, with Gary Brown (UW-Madison’s Director of Planning and Landscape Architecture), and with Alan Fish (Associate Vice Chancellor for Facilities Planning and Management) to make sure that the plan addresses all key challenges facing the Preserve. Another key goal has been to integrate the Preserve master plan with the campus-wide master plan update being done at the same time. (One exciting aspect of the new campus master plan is its emphasis on the open space of the campus as a defining feature of UW-Madison…an emphasis that finally recognizes how important the Lakeshore Nature Preserve is to the university as a whole.) Extensive input and commentary were sought throughout the planning process from interested stakeholders and from the public at large. Members of the Friends of the Lakeshore Nature Preserve were heavily involved throughout the process. What are the most important recommendations of the master plan? We’re committed to managing the Preserve as a single integrated unit, with a unified trail system that runs from the Union Terrace all the way to Shorewood via the Lakeshore Path and Picnic Point. We want to make the Preserve much more prominent in people’s minds as a defining feature of the campus and the city. New maps, new signs, new interpretive literature, a new website: all of these will help increase the visibility of this special place and help people appreciate how precious it is. We’re defining key locations as “gateways” to the Preserve, at the eastern end of the Lakeshore Path, at the Frautschi Point parking lot, and especially at the base of Picnic Point. In particular, we plan to construct the main gateway for the Preserve at the entrance to Picnic Point to help welcome and orient visitors. Perhaps the most exciting and transformative new design proposed by the master plan is located at the tip of Picnic Point, an area that has become so overgrown with buckthorn, honeysuckle, and other exotic shrubs that it is literally impossible to see the spectacular view of the Madison skyline that is the main reason visitors make the mile-long trek to the end of the peninsula. To see that view, visitors are now forced to scramble down steep slopes with exposed tree roots, mutilated vegetation, and heavily eroded soils because the view everywhere else is blocked–and because no well-designed route has been provided for reaching the water’s edge, as virtually every visitor to Picnic Point eventually wishes to do. The master plan therefore proposes to redesign this heavily eroded and damaged area by providing a stone storytelling circle where large groups can gather (as many UW students do every semester). In addition, rustic stone steps will be constructed to guide visitors down the slopes to the edge of the lake in such a way that eroded slopes will be stabilized and damaged vegetation can regrow. Finally, invasive shrubs will be cleared and views will be reopened so that the full beauty of the Madison skyline will once again be visible from this famed vantage point–a place that city residents have been celebrating for its views since the middle of the nineteenth century. A much smaller gathering place is proposed in the plan for Frautschi Point, an area that will become much better integrated with the rest of the Preserve as a result of master plan recommendations. In addition, general locations have been designated for occasional benches where walkers can rest and enjoy the view as they explore the Preserve. The plan offers complex recommendations for managing the vegetation of the Preserve with an eye to restoring a variety of native habitats in appropriate locations. Among the most exciting of the proposed changes is a zone where existing open-grown bur oaks will be used to form the core of a restored oak savanna, a vegetation type that was once among the most common in southern Wisconsin, but that has almost disappeared since the nineteenth century. To promote restoration of prairie, savanna, and oak forest, the plan proposes to reintroduce controlled burning to the Preserve. Although regular fires were part of the ecosystems of this area for thousands of years prior to Euroamerican settlement, they have been absent from the Preserve (except for the Biocore Prairie and the Class of 1918 Marsh) for a century and a half. Reintroducing fire will be a key management tool that can serve multiple goals: removing invasive species; restoring savanna and other fire-dependent vegetation types; experimenting with restoration techniques; and serving the research and teaching missions of the university by giving students direct experience with fire management. A separate set of recommendations are offered for enhancing the Class of 1918 Marsh, a pioneering example of a restored wetland that was created with generous support from the Class of 1918 back in 1972. By doing a better job of managing run-off from the UW Hospital complex and other buildings of the west campus, and by working to promote a diversity of community and habitat types, the marsh can provide better wildlife habitat, healthier plant communities, and better learning opportunities for students and visitors. The plan identifies key views to and from the Preserve as defining features of the visitor experience, and offers recommendation for restoring views that were far more common in the past before the Preserve became choked with invasive shrubs. Although most visitors never see it, an area of the Preserve near the base of Picnic Point provides a crucial staging area for the University’s Physical Plant. The environmental impacts of this staging area are greater than they need to be, as is its visual presence in the landscape. The plan makes recommendations for redesigning the staging area to diminish its impact on surrounding vegetation and watersheds while also providing storage facilities for the adjacent community gardens. The plan for the first time analyzes the many trails and roadways that connect different parts of the Preserve, and offers systematic recommendations for diminishing the impact of problematic routes while enhancing the visitor experience and managing routes in a much more integrated fashion. We hope it will become more common in the future for walkers to trek all the way from the Union Terrace to Shorewood along the trails of the Preserve. As part of the research that went into producing the master plan, archaeologists confirmed what we already knew, that UW-Madison probably has a greater abundance and variety of archaeological features–effigy mounds, village sites, old shoreline camps, and so on–than any other university in the country. Many of these archaeological features are located within the Preserve. Some are Native American sites dating to pre-Euroamerican times, while others are the remains of nineteenth-century farmsteads and past university activities on these lands. Very few of these intriguing features are adequately interpreted for visitors, so most people probably never even see them. A key goal of the master plan recommendations is to improve our management and interpretation not just of natural landscapes in the Preserve, but cultural ones as well. The master plan warns of the very serious sedimentation problems posed for University Bay by Willow Creek, which drains a watershed on the west side of Madison reaching all the way to Hilldale Shopping Center and beyond. Although we were unable to recommend solutions in the plan itself, we warn that the University needs to work together with the City of Madison and the State Department of Natural Resources to address this problem in the future. The plan makes many other recommendations for improving the Preserve. Anyone wanting to learn more should read the report. Will every detail of this master plan become a reality? Almost certainly not. Remember, the goal of a master plan isn’t to provide detailed blue prints for all of its recommendations. Its purpose is more conceptual: it provides an analysis of the present and offers a visionary sketch for a better future. Our job is now to identify the most important and urgent recommendations, the ones we’re most eager to act on immediately, and to seek the funds that will enable us to move those recommendations forward. Before we act on major recommendations, there will in many cases need to be additional plans and blueprints and detailed decisions. No doubt recommendations will change and evolve as we learn more about how to do a better job of caring for the Preserve. But the master plan is a HUGE step forward, and we can’t wait to get down to moving forward from this point.